Protection International alongside representatives from the East and Horn of Africa Human Rights Defenders Project (EHAHRDP), CIVICUS and CSOLifeline, met with UN High Commissioner for Human Rights Zeid Ra'ad Al Hussein, on the margins of the 31st session of the Human Rights Council, to discuss the deteriorating human rights situation and the threats faced by human rights defenders in Burundi. Human rights defender Pierre Claver Mbonimpa, President of APRODH, addressed the Council on Friday to denounce enforced disappearances, arbitrary arrests, torture, sexual violence and extrajudicial executions, the closing down of human rights organisations, and that scores of human rights defenders and journalists who have been forced to flee the country in the last 10 months. Shortly after reading his statement, Pierre Claver Mbonimpa participated in the side event on the human rights situation in Burundi "Crisis in Burundi. Implementing sustainable solutions" with Michel Forst, United Nations Special rapporteur on the Situation of Human Rights Defenders, Tom Gibson, Protection International representative for Burundi and DRC and Clea Kahn-Sriber for Reporters Without Boarders. Pierre Claver Mbonimpa gave a moving testimony about his commitment to the defence of human rights in Burundi, the time he spent in jail and his survival of an assassination attempt. On behalf of Burundian defenders who were not able to travel to Geneva, he denounced the lack of an independent judiciary and independent media in Burundi. Michel Forst, briefed the participants about his mission to Burundi at the end of 2014 when he witnessed worrying signals of the escalation of violence in the country. He expressed concern for the growing number of attacks to defenders and journalists. 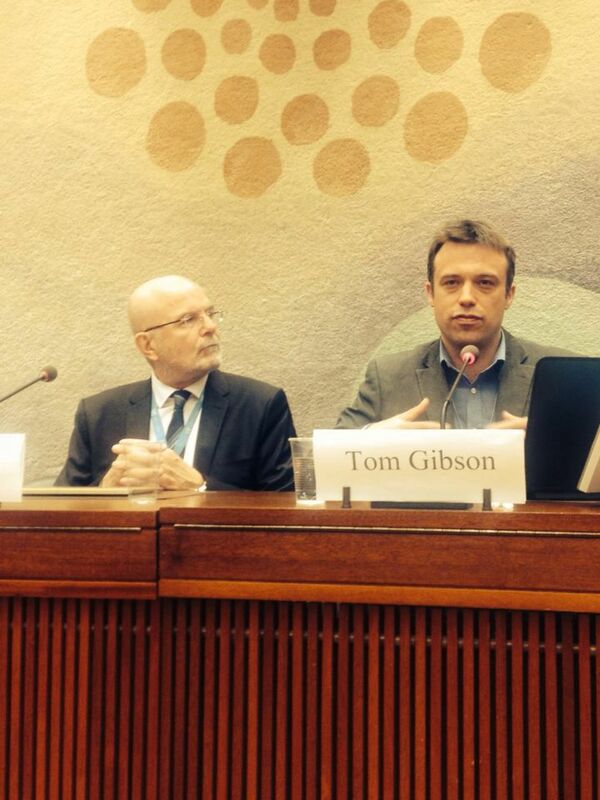 ‘There is the palpable sense of fear and insecurity among defenders in Burundi’ said Tom Gibson. He added: ‘the greatest threats to HRDs are arrest and forced disappearance which is concerning also in relation to their family members’. PI’s advocacy in Geneva takes place at a critical moment for Burundi when a team of independent experts mandated by the UN Human Rights Council has finally entered the country to conduct investigations on human rights abuses and to engage in a dialogue with the authorities and other relevant actors in relation to the ongoing crisis. The independent experts are expected to give an oral update to the Council on March 21, during the interactive session on Burundi in Geneva. Many, however, remain concerned for the risk of reprisals for activists and human rights defenders who interact with the group of experts during their visit.